Jack Fulton Alkire, 83, of Xenia, formerly of Washington Court House, Ohio, died Wednesday, September 12, 2018, at 2:08 p.m. at Ohio’s Hospice of Dayton where he had been a patient since September 9. He was born March 5, 1935, in Washington Court House, Ohio, to Fulton Marcus (Footie) and Sarah Walker Alkire of Alkire’s Bakery, a well-known Washington Court House business for over 75 years. 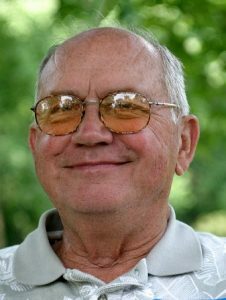 He was a 1953 graduate of Washington High School and was a life-long resident of Fayette County before moving to Elmcroft of Xenia last fall. Jack worked in advertising for the Wilmington News-Journal, the Circleville Herald, and the Record-Herald. He had been the general manager at Marting Manufacturing and the owner of Builders’ Supply. He was also on the board of directors for a local bank. He was a Quaker. He was an active member and former president of the Good Hope Lions Club and a member and past president of the Washington Court House Rotary Club and the Washington Court House Chamber of Commerce. Jack was also an U.S. Army veteran. Jack is survived by his wife, the former Beverly June Carey whom he married August 1, 1959; four children and their spouses, Dr. Nancy Lynn Alkire and her husband, Scott Seaman, of Columbus, Susan Carrie Zaffiro and her husband, Paul, of Liberty Township, OH, David Jack Alkire and his wife, Keya, of Mount Sterling and Jennifer Ann Schiff and her husband, Brian, of Wake Forest, NC; six grandchildren, Sarah Zaffiro (Kyle Karnes), Rachael and Carissa Zaffiro, Cole and Carter Schiff, and Dean Alkire; and a sister, Sarah Jane Alkire of Xenia. The funeral will be held Saturday, September 15, 2018, at 2 p.m. at the Kirkpatrick Funeral Home in Washington Court House with Mike Mc Cormick officiating. Burial will follow in the Madison Mills Cemetery. Friends may call at the funeral home Saturday from 11 a.m. until the time of the service. Memorial contributions may be made to the Alzheimer’s Association of Central Ohio, 1379 Dublin Road, Columbus, Ohio 43215 or the Hospice of Dayton Foundation, 324 Wilmington Avenue, Dayton, Ohio 45420. I am so sorry to hear about Jack’s passing. He was my father’s first cousin, and I had the pleasure of meeting he and Sarah and Footie many years ago. I look occasionally for the old Alkire’s in the area and just learned of your loss. I have so many stories from my Dad (Earl Alkire) about Elmer and Raymond and my grandfather. It is so sad to see them all go. My thoughts are with you and my door is always open to share memories and provide support.